The E-TEC Gen 2 300 is the most powerful in Evinrude’s line-up and boasts impressive low-down torque and cost-saving fuel economy. It might also be the sexiest looking outboard ever to hit the market, especially when colour matched from a palette of six sides and top panel options, and 14 accent stripes. But colour is only skin-deep, so the E-TEC better pack a solid punch if it wants to live up to its striking looks. Hidden below the cowlings are a plethora of green and power technologies that make the two-stroke a stand-out in a market almost exclusively given over to four-strokes. When emission laws across the world tightened, Japanese engine builders turned to four-stroke technology. In America, Evinrude took the seemingly more difficult path to clean certification in the belief that the oil burner could surpass its competitors with better power delivery and economy. But to do it they first needed to clean up the notoriously vintage technology. Two-strokes are simpler and more efficient because they produce twice the number of power strokes as a four-stroke. Without exhaust valves, camshafts and belts or timing chains, they also have fewer moving parts. And no crankcase oil changes. This should also mean reduced maintenance costs and to this end, service times are increased to 300 hours. Computer control delivers a lean 14:1 fuel mixture through high-pressure fuel injection for the right amount of mix for varying conditions. This is designed to react immediately to changes in throttle setting and it sure felt it during our drive. 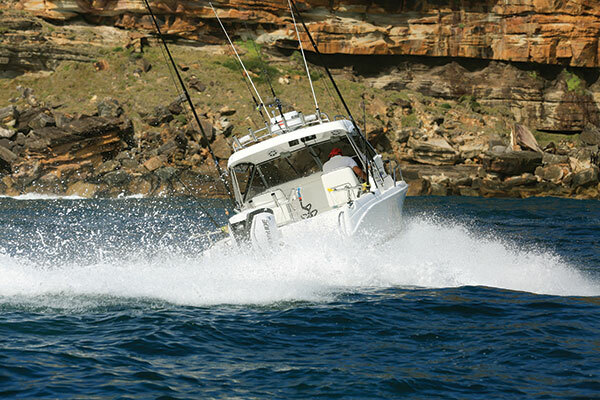 Right through the range to WOT, when you plant the throttle, the boat surges forward. New to the Gen 2 engines is Pure Power combustion, with a redesigned chamber that ensures all fuel is burned for more power and minimum unburned fuel passing through to the atmosphere. Gen 2 exhaust manifolds are now routed to the outside of the cylinder blocks, instead of through the void in the centre, in what’s called Starboard-Starboard for better flow and improved cooling of the block at the exhaust. 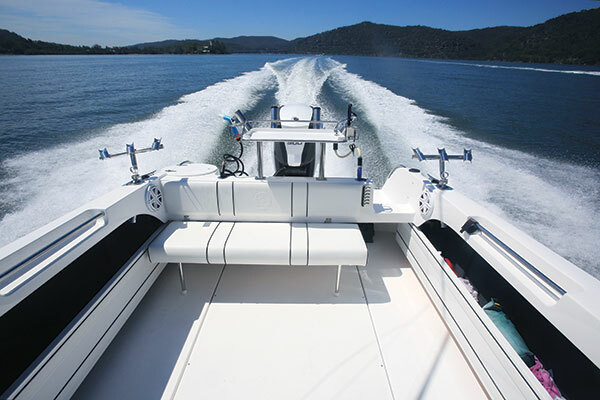 On the Caribbean 2300 test boat, the single 300 performed faultlessly. From first kick in the morning, right through the speed trials and simulated trolling runs, there wasn’t a whiff of oil. At low speeds, engine noise was a throaty induction growl, which rose to a relatively noisy exhaust note at anything above a slow cruise. From rest we jumped out of the hole and accelerated purposefully to a fastest run of just over 43kts (6000rpm) where the injectors were sucking down the fuel mix at 91lt/h for a theoretical range of 182nm from the 425lt tank. Best economy was at 3500rpm where fuel burn measured 32lt/h at 24.5kts and a range of almost 300nm. I’m impressed. A 7kt troll came up at 2100rpm and 13lt/h. Of course, with all of these calculations you need to factor in the oil, which mixes from a remote reservoir at an average of about 1:8 ratio. (The computer adjusts oil use as needed). So at a 3500rpm cruise, you should travel approximately 25nm and consume 32lt/h. At that speed, for every 100nm expect to use 1.6lt of oil at about $20 to $25 a litre. Single 300hp Evinrude E-TEC G2.